It is 30 days since the Israeli military stopped the Freedom Flotilla Coalition’s ship Al Awda and took control of the medical supplies for Gaza… For one month the Freedom Flotilla Coalition has demanded the immediate release of the 114 boxes and thousands of people from around the world have called Israeli embassies and the Ministry of Foreign Affairs in their countries demanding the release. Please sign the petition demanding that the Israeli military releases the boxes of medical supplies. The medical supplies are desperately needed in Gaza as Israeli snipers continue to kill and wound hundreds of Palestinians each week. On Friday 24 August 2018, using excessive lethal force against the peaceful protesters in eastern Gaza Strip for the 22nd Friday in a row, Israeli forces wounded 89 civilians, including 17 children, 2 women and 3 paramedics, after hitting them with live bullets and tear gas canisters. Five of those wounded sustained serious wounds and dozens of civilians suffered tear gas inhalation. According to the Palestine Centre for Human Rights (PCHR), 130 Palestinians have been killed, including 23 children, 3 journalists, 2 para medics and 1 woman. Among those killed are three people with disabilities and a young girl. 6,729 people have been wounded by gunfire including 1,140 children, 203 women, 78 journalists and 103 paramedics. Among those wounded, 422 are in serious condition and 69 people have had lower or upper limbs amputated. Statistics of the injured only include those directly hit with bullets and tear gas canisters, but there are thousands of other people who have suffered tear gas inhalation and sustained bruises. 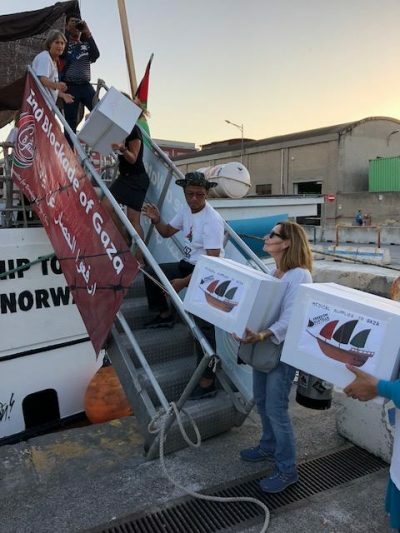 The Freedom Flotilla Coalition continues to demand the immediate release of the 114 boxes of medical supplies (sterile gauze and sutures) for the health services of Gaza that were carried on the Al Awda and Freedom boats of the 2018 Freedom Flotilla to Gaza, hijacked by Israeli forces on July 29 and August 3. As Swedish Foreign Affairs Minister Margot Wallström has stated, the cargo must be released, according to international law. Additionally, the San Remo Manual on International Law Applicable to Armed Conflicts at Sea (12 June 1994) says in paragraph 104: “The blockading belligerent shall allow the passage of medical supplies for the civilian population or for the wounded and sick members of armed forces, subject to the right to prescribe technical arrangements, including search, under which such passage is permitted. Further, the Manual on the Law of Non-International Armed Conflict (2006), says in point 2 in the commentary to Rule 2.3.10: “By extension, all objects indispensable to the survival of civilians should be protected, especially medications. The protection means that the enemy is not permitted to attack, destroy, remove, or render useless the aforementioned items.”Our Israeli attorney, Gaby Lasky has been in contact with Israeli Occupation authorities to arrange delivery of the humanitarian medical supplies, but to date none have arrived in Gaza. On July 29, 2018 the Al Awda, a ship belonging to the Freedom Flotilla Coalition and subsequently a second vessel, the Freedom, were brutally attacked by Israel Occupation Forces in International waters, resulting in injuries to five peaceful participants as well as the unlawful and unwarranted confiscation of the boats, intended to be gifted to fishers in Gaza, the illegal detention of participants and crew, and confiscation of their cargo of desperately needed medical supplies. These basic medical supplies were intended to be distributed to those on the front lines of Gaza’s humanitarian crisis.